To help celebrate ESF's 40th anniversary, we have created photo albums for each decade, starting in the 1970s. Make sure you come back as more photos will be added here in the weeks leading up to the celebration event. ESF book will make a perfect gift! 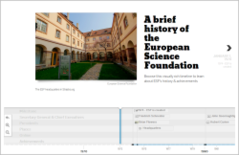 To honour ESF's first 40 years, we have created an online timeline. We hope you take the time to relive our glorious past. For those who would like to share any memories of a particular moment that stands out during your time affiliated to the ESF, please follow the link below. What's new on Twitter ?